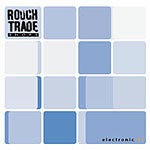 If anyone were to do a series of compilations tracking the development of electronic music in all its forms, you couldn't ask for a better collaboration than the Rough Trade shops and Mute Records. The former has been selling this stuff since 1976, dealing with the most esoteric demands of their customers, while Mute has been pioneering electronic music since it took the baton from Industrial Records in the early 80s. As a result, this collection is everything you could hope it to be, the only criticism that can be made is that, with only 40 tracks, there's so much left out (as they acknowledge themselves). This will hopefully be redressed in Electronic 02. All the great names are here - "krautrock" pioneers Can, Faust and, of course, the seminal Kraftwerk, experimentalists Brian Eno, Pierre Henry and John Cage, the original industrial sound of Throbbing Gristle at its most accessible and influential on 'hot on the heels of love' and one of their three spin-offs, Coil, here remixed by Elph on the stripped down and edgy 'ended' (alas, the other two, Chris and Cosey and Psychic TV, are missing, maybe next time). Then there's the less accessible industrial noise of Non's 'out out out', and a dash of new wave electronica - the Normal's 'Warm leatherette', featuring Mute boss Daniel Miller on vocals, from '78 and Bruce Haack's 'Mean old devil' from '79. Then there's the big names of synthpop, Depeche Mode with the instrumental 'Big muff' from the early years, the Human League with 'Being boiled' from their pre-"Dare" industrial era and New Order's proto-house '586', each displaying the massive influence they had on subsequent dance culture. This compilation doesn't just stick to the obvious starting points, though, as it includes Rod Freeman & the Blue Men's experimental electronica from 1960, a mix of rock n' roll and distorted vocals and strange noises on 'I hear a new world' that was way ahead of its time, as well as, surprisingly, the theme music from Dr Who. This however, seems far less strange when you listen to it, hearing its moody mix of electronic noises and sharp rhythmic sounds. There's no wonder the KLF saw fit to sample it for their Timelords No. 1. However, this compilation is in no way stuck in the past, also showcasing progressive sounds from the likes of Autechre and Aphex Twin, as well as the increasingly popular nu-electro scene with Fischerspooner, I-f and Aux 88. Or, for those who prefer more vocal-based stuff, there's the deliciously smooth pop sounds of Barbara Morgenstern or Stereolab's delightfully fluffy 'freestyle dumping' (complete with "la, la, las"). For those who think electronic music begins and ends with the dance scene, or are of the impression that synth-based music automatically means cheesy pop music made by Vince Clark and friends, this should be an eye-opener. For anyone with a better knowledge of electronic music, this is so diverse that it should still hit you with some stuff you don't know. All in all, this definitively proves that music can be as interesting when made with synths and computers as anything done with guitars, bass and drums. Roll on part two; my further nominations for inclusion are Cabaret Voltaire, DAF, Nitzer Ebb and Suicide.